LUA | What Does LUA Mean? 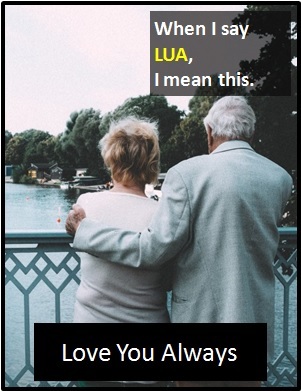 LUA means "Love You Always". The abbreviation LUA can be used to express strong feelings of love for someone or as an informal way of ending a conversation. LUA means "Love You Always". Marie: Do you think we'll ever get married? Errol: Err, umm, we don't need to do that, you know I LUA don't you? Tina: Thanks for dinner tonight, it was great to see you. Simon: No problems, LUA and hope to see you again soon. As it is pronounced using its individual letters (i.e., "Ell Yu Aye"), LUA is classified as an initialism abbreviation. Initialisms are different to acronyms, which are spoken like words. Before the digital era, we might have said something like "I will love you forever" or "forever yours" instead of LUA.